CPH + Malmö teams up for a total take over. For some reason, Fast Forward Productions haven’t introduced themselves at Malmös only legit club venue Inkonst, yet. The 19th of May, Malmös ’under the radar’-crew Astrum are making this happen, and teams up for a total take over. 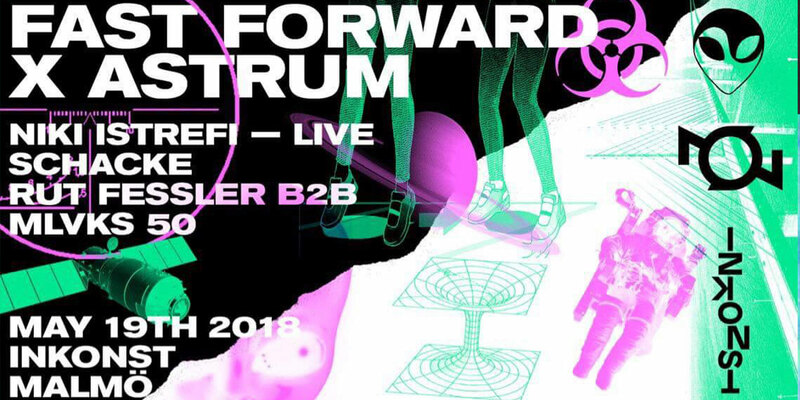 Anyone who’s into techno and been to Copenhagen must know about the Fast Forward movement and at least some of their members. We can easily say that we’ve got hold of some of their top players for this night. Schacke is one of the frontiers in Fast Forward. He recently had his debut at Berghain, frequently playing at Tresor as well as other clubs in Europe. Niki Istrefi is also one of their frontiers, as well as the co-founder of Euromantic. His solo album released on the label last year was quick to become a big hit, and have been played around the world.